THE RED FLAG WARNING IS NOW IN EFFECT UNTIL 8 PM PDT WEDNESDAY. A LONG DURATION OF SINGLE DIGIT HUMIDITY LEVELS WILL CONTINUE THROUGH WEDNESDAY EVENING... MAINLY IN THE FOOTHILLS AND THROUGHOUT THE SANTA MONICA MOUNTAINS...WITH OVERNIGHT HUMIDITY LEVELS ONLY RECOVERING TO BETWEEN 10 AND 20 PERCENT. 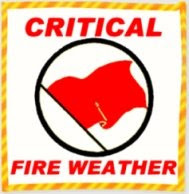 A RED FLAG WARNING MEANS THAT CRITICAL FIRE WEATHER CONDITIONS ARE OCCURRING. A COMBINATION OF LOW RELATIVE HUMIDITY...VERY WARM TEMPERATURES... AND CRITICAL FUELS WILL CREATE EXPLOSIVE FIRE GROWTH POTENTIAL. PLEASE ADVISE THE APPROPRIATE OFFICIALS OR FIRE CREWS IN THE FIELD OF THIS RED FLAG WARNING.